Osprey is a great backpack company. Its humble origins began in Colorado and since then Osprey has become one of the biggest backpack manufacturers in the country. The Aether is a robust and versatile bag that can haul heavy loads and works particularly well as a traveler’s backpack or a mountaineering pack. Hiking up Glacier Calluqueo, Patagonia. 1. Durable: The only thing I had to replace on this pack over the years is a hip belt buckle and it was my fault that it broke. This pack is quite rugged and can take a punch. I brought the Aether with me to Patagonia. In an unknown valley just south of Cerro San Lorenzo, I found myself bushwhacking through chest high calafate (think giant thorn bush!) while traversing a 60 degree slope. Between the large river gorge to my left and the spiky gauntlet surrounding me, the last thing I needed was a pack that couldn’t hang. The thick fabric shrugged off the inch long prickers with ease. The Aether is not invincible, however. Over the years, small holes have been torn into the mesh back pocket but they do not spread and the mesh is still functional. 2. Load Carrying Ability: The Aether will carry 65 lbs with only a little discomfort. For loads over 50 lbs, I believe discomfort is inevitable. So when all I had was some slight discomfort with 65 lbs, I was rather impressed. The pack’s internal frame transfers the weight completely to my hips with weight under 45 lbs, a little less so at 55 lbs and more so at 65, etc. The heaviest load I ever had to carry in the Aether was 90 lbs. No pack out there carries 90 lbs well so I’ll just go ahead and say that it was a bad day. Off trail and a relatively scorching 70 degrees (compared to the previous three days of snow storms), my team and I were hiking through the Patagonia steppe. To say we went slow would be an understatement. It took us 7 hours to hike 3 miles. A few people decided to lighten their loads by getting rid of the breakfast in their stomachs. 3. FEATURES! FEATURES! FEATURES! : Trek Pole storage. This pack has it. At first, I thought it was a stupid little gimmick and was going to cut it off. However, after having to stow one pole so one hand could hold an ice axe, I found it really useful. Whereas other people needed to take their packs off to find space to lash their trek pole to, I could stow one or both of my poles easily in the loops without having to take off my pack. There is the option of having a separate sleeping bag compartment but I use a trash bag on the inside of the pack, so I rarely use this feature. It also opens up on the front of the pack with a door panel and zipper. The Aether’s brain can be removed and used as a lumbar pack, which really comes in handy for light and fast peak bagging. I could fit two 1 liter Nalgenes, a puffy and some snacks and then go out for a nice climb. Two ice axe loops really came in handy, especially when you have to carry three ice axes (picture up and left). It boasts the usual bells and whistles of every other pack. Hydration sleeve and port, sleeping pad straps, external mesh kangaroo pocket, load lifters and of course a myriad of compression straps to really lock the weight down and dial you in the perfect fit. Getting the perfect fit is not impossible with Osprey packs. With the exception of a few, most Osprey packs come with a velcro pack panel, which allows the shoulders straps to move upward or downward. That, coupled with the optional custom molded hip belt (REI), you can really make this pack yours. 4. Capacity/Volume: At 85 liters, this pack can fit quite a lot. I’ve stuffed it full of clothing and size 15 shoes and backpacked three months through Europe with it, only to get more filled along the way. 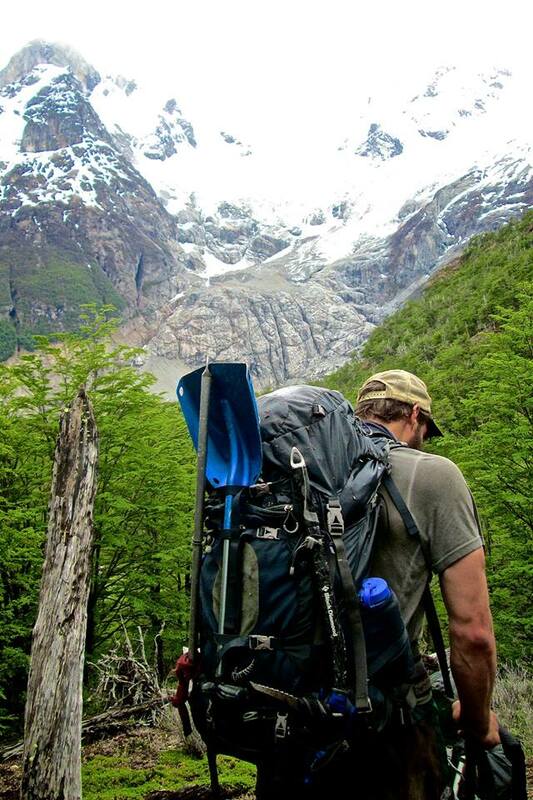 It competed with 110L packs in Patagonia when I was climbing around Cerro San Lorenzo. I had 25 liters less volume but I still managed to get all my stuff, my share of food and group gear in. Yes, I carry very little so there is more space. Yes, the pack looked like a dense nylon nugget. But it got the job done. 1. Weight: This pack is heavy. I have a medium and it is 5 lbs, 1oz. There are a lot of packs out there that are lighter in terms of general three season backpacking and especially long distance hiking. I wouldn’t use it for anything short of a rugged backcountry expedition or to toss clothes into and travel the world with. 2. Strap Pads are uncomfortable: Compared to the Gregory Baltoro 75, the Osprey Aether hip belt and shoulder straps are very uncomfortable. Yes, you can custom mold the hip belt but it still doesn’t move well with your body. The hip belt is also a little thin for a pack that you will use for heavy loads. 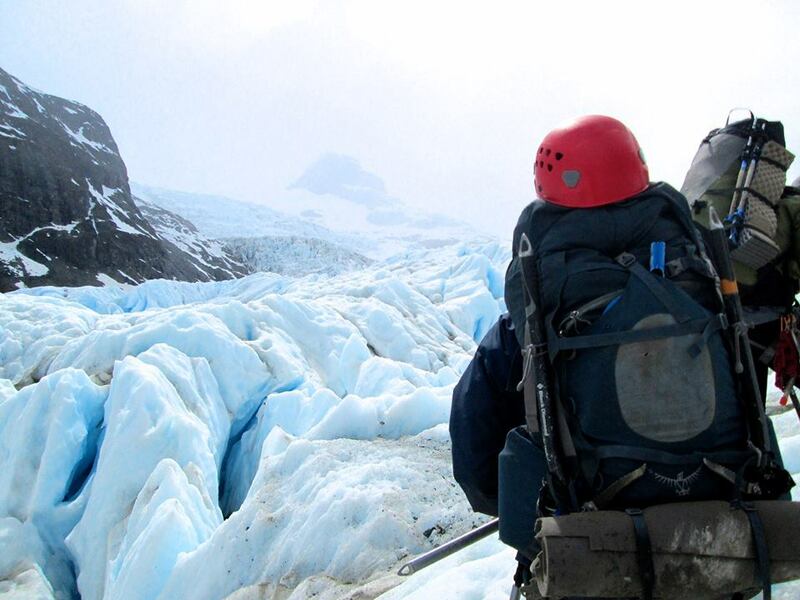 The Baltoro and other large packs usually use a wider hip belt to displace more weight evenly. The shoulder straps are equally thin and could also be wider. The pack fits well and the discomfort wasn’t terrible. It was also lighter than the Gregory Baltoro 75. But if weight isn’t such a big deal for you, check out the Gregory- it is heavier but the hip belt and shoulder straps are way more comfortable. 3. Useless Weight: All those features come at a price and that price is ounces. There are many little clips and straps I never use that are attached to the pack adding weight to it. Cutting these things off is not an option as it would cause holes in the bag. I would recommend this pack for the traveling backpacker and for those who carry big loads when climbing in the mountains but still want to keep pack weight as low as possible. It is strong, versatile and a great product from a great company.